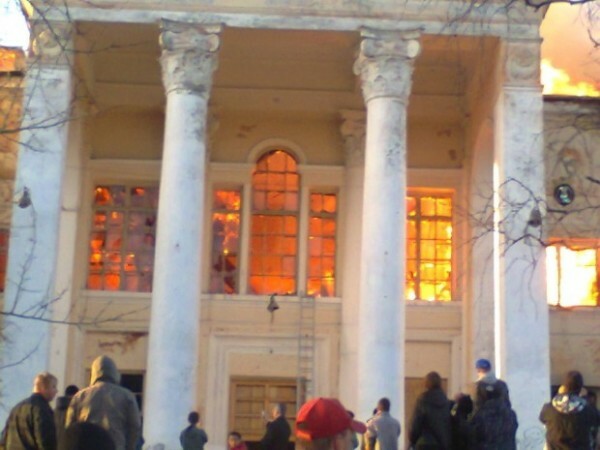 Most of the photos below are of the “Officers House”, built in the late 1930s, served as the town’s major concert hall till 2010, then the army was unable to maintain and closed it after which the best building in Kandalaksha went through a series of fires that damaged it beyond repair. The last one was in March or April 2013. Now the building is used as a dangerous playground for tough Russian kids. Towards the end of the series of photos you’ll see some looking down from what remains of the roof. Stairs lack railing and invite anyone with a suicidal tendency or just a dizziness spell to a 30 foot drop. Fire 21 April 2013, when the building was damaged almost beyond hope. Weather and vandals will soon do the rest. The one next door (6-8 photos at the very end) is what’s left of the military hospital. Lots more ruins, especially in this part of town, but the Officers House is the most spectacular of them all. Are there any districts in Kandalaksha with old wood houses? Like in Perm and Arkhangelsk, Russia. Attached photo is the Mikhail Kalashnikov (designer of the AK-47) museum at Kurya, Altai, Russia. The city is new but there are still some wooden huts in the “Japan” area. See http://kandalaksha.su/516/. And lots of pre-war wooden barraks, some still inhabited. “Barracks” in the sense of temporary basic shelter, not specifically military. If I have photos of these they should be in the Abominatio desolationis section http://kandalaksha.su/category/subjects/photography-filming/abominatio-desolationis/. But no, no classic old wooden mansion-type buildings. These disappear somewhere in Karelia as you go north. The closest you are going to find to the above is perhaps the railorad station.